Why Do You Need Commercial Fire Protection? If you own a commercial or multi-residential building, investing in commercial fire protection is key. You want to make sure that both the people using your property and your investment itself are safe and secure. If you own a commercial or multi-residential building, investing in commercial fire protection is key. You want to make sure that both the people using your property and your investment itself are safe and secure. While buildings can be rebuilt, lives cannot, making commercial fire protection of the utmost importance. Making use of fire alarms and sprinklers are key. 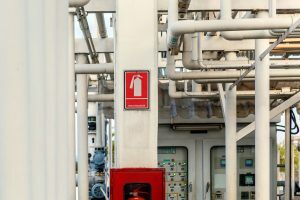 Read on to learn more about the ins and outs of utilizing commercial fire protection. A fire sprinkler system that works in conjunction with your alarm system is extremely important. According to one recent study, fire sprinkler systems worked in 90% of all reported large scale fires. This means that 9 out of 10 times, sprinklers activate during fires. This will not only keep humans safe, but cut your damage losses dramatically. You can’t afford to not invest in a well-maintained sprinkler system. There is no telling when a disaster may strike, or when an accident may happen. Without around the clock monitoring, your building may be unprepared for what strikes. A proper fire protection system monitors your building around the clock so fires are detected early and response is swift and effective. This can be the difference between life and death when it comes to fire. The second there is any unusual and potentially dangerous activity, a team of trained technicians who are ready to tackle to the problem will be aware of it. These larger buildings need more than the standard smoke-detection and alarm systems used by many residential single-family homes. In such a large and complex space, where so many people may live or work, safety of this advanced nature when it comes to fires is an absolute necessity. These state of the art systems are highly effective and sensitive. They cover more area with far less hardware, and can detect the early signs of fire way more effectively than many standard and older systems. They can play an absolutely crucial role in preserving life and property. If you need commercial fire protection, Judd Fire can help you today! This entry was posted on Monday, April 10th, 2017 at 5:58 pm. Both comments and pings are currently closed.